ask Charlie and Rebecca owners of the El Morro Valley Ranch in Ramah, NM. To insure consistent “alive” nutrition for their animals they purchased a self-contained “grass grower”. 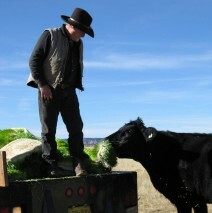 The cattle is raised for Sweet Grass Co-Op , the locally raised all grass fed and finished beef that Joe’s uses for Burgers. Fodder Solutions barley sprouts have been tested at every stage of growth. The peak spectrum of nutrients are available at the 6 day growth stage, this is when the barley sprouts are harvested. The nutritional breakdown of the barley sprouts shows that the sprouts are very high in energy and protein and contain sufficient of these to meet the needs of most stock. Barley grass is considered the most nutritional of the green grasses containing an abundance of nutrients unsurpassed by any other type of grass. The benefits of fresh green feed such as barley grass have been well documented over the past 50 years. Independent research studies have been conducted by qualified academic institutes that prove the value of using barley grass. These studies show that barley grass is both beneficial to livestock and cost effective as a substitute for the traditional fodder supplements. Valley Ranch in Ramah, NM.